Click a button to download the latest version of Visual Studio 2019. For instructions on installing and updating Visual Studio 2019, see the Update Visual Studio 2019 to the most recent release. Also, see instructions on how to install offline. 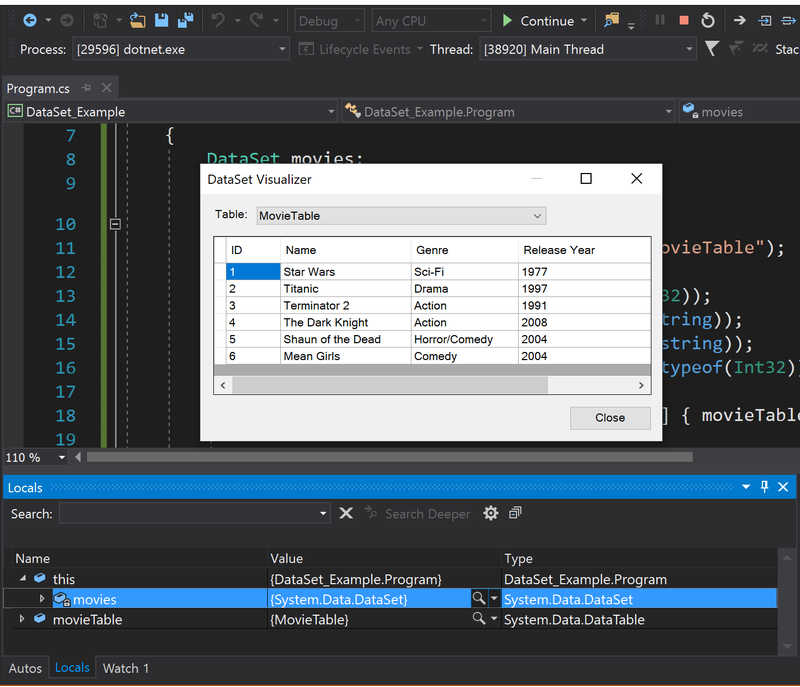 Visual Studio 2019 Preview 2 is now available. 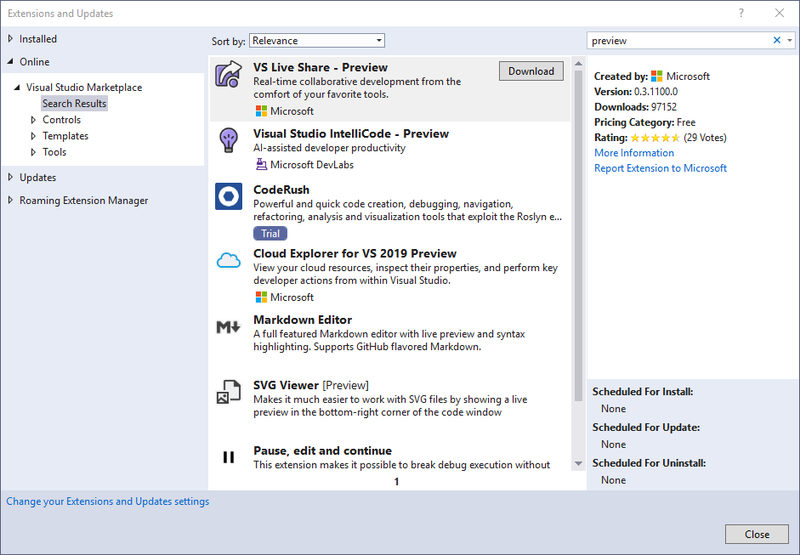 Visual Studio Live Share for real-time code reviews and interactive education. Visual Studio IntelliCode supports more languages and learns from your code. The solution name in title bar is truncated. Missing interpolation in warning when packaging Cloud Service projects. Visual Studio will no longer show an error message on startup after you reset or import settings in certain cases. Accessibility issues in Cloud Service projects where wrong inputs in the diagnostics configuration window are not read by screen readers have been fixed. Add option for Windows (UWP) platform when creating new Xamarin.Forms project from 'Mobile App (Xamarin.Forms)' project template. Help > About window title in Visual Studio 2019 still shows 'RC' after upgrade. When updating Visual Studio 2019 from RC to GA, RC shortcuts for Visual Studio are left behind. Visual Studio 2019 Preview 1.1 cannot create a UWP xamarin form. Package load failure starting Visual Studio 2019 after upgrade from Preview 4.4 to 16.0. Break when a specific object's property value changes in .NET Core 3.0+ applications using data breakpoints, a feature that was originally exclusive to C++. Since Preview 1, we have updated the UI for searching in the Autos, Locals, and Watch windows with a simpler interface. The Search Deeper function has been changed to a dropdown so you can quickly select how deep you want your initial and subsequent searches to be. You can now choose how to install Visual Studio updates. The default mode is ‘Download all, then install’ which allows you to continue using Visual Studio while updates are being downloaded. Note that, if you select ‘Download all, then install’, you’ll need to finish up the installation by opening the Visual Studio Installer and selecting Continue. Visual Studio updates will now be downloaded in the background. These downloads will occur only when your machine is idle. When the downloads complete, you will get a notification inside Visual Studio that your download is now ready to install. You can now control your update installation mode and whether to download updates or not through the Tools > Options menu by changing the settings on Product Updates page. The new start window provides a streamlined launch experience to help you quickly get to your code upon starting up Visual Studio. View your recent projects and folders, and open them with a single click. Pin and remove items from the list through the context menu. Clone or check out code by using any public or private git URL, which will also automatically open the folder in the IDE. Sign in, browse, and one-click clone or connect to your hosted repositories from Azure DevOps or install extensions for other source control hosts to view repositories owned by you and your organization. Browse your local disk or network share for projects, solutions, or any folders containing code, and open them in the IDE. Select a project template that provides you with code scaffolding to help you get started with a new project or solution. Search for project templates by their title, description, and tags or filter through available languages, platforms, and project types. The default list shows all available templates, while a list of your top 10 recently used project templates appears on the left pane for quick access. A two-page wizard allows you to concentrate on one decision at a time. 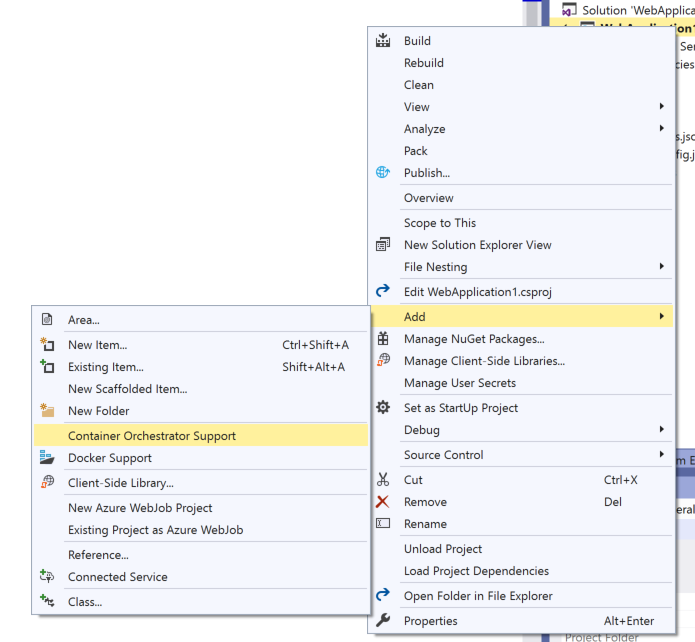 Quickly spot which version of Visual Studio you're opening and using via the new, improved product icon. The new icon is also more visible against a variety of backgrounds. Experience a modernized look and feel of Visual Studio with our refreshed blue theme that gives you a cleaner user interface while still meeting our accessibility standards. See more of your code, through our changes that target compactness and reclaim vertical space in the IDE. We have combined the title bar and the menu bar while also preserving existing functionality. Use Visual Studio as a Per-Monitor Awareness application through a new, experimental setting. When on, this setting helps parts of Visual Studio, such as the shell and the editor, render more sharply regardless of your display configuration and/or scaling. Experience an enhanced search experience across menus, commands, options, and installable components. Our new search now displays results dynamically, accommodates spelling errors, and provides relevant information (such as keyboard shortcuts) inside the search results. View health information associated with your currently open file through the Document Health Indicator feature. 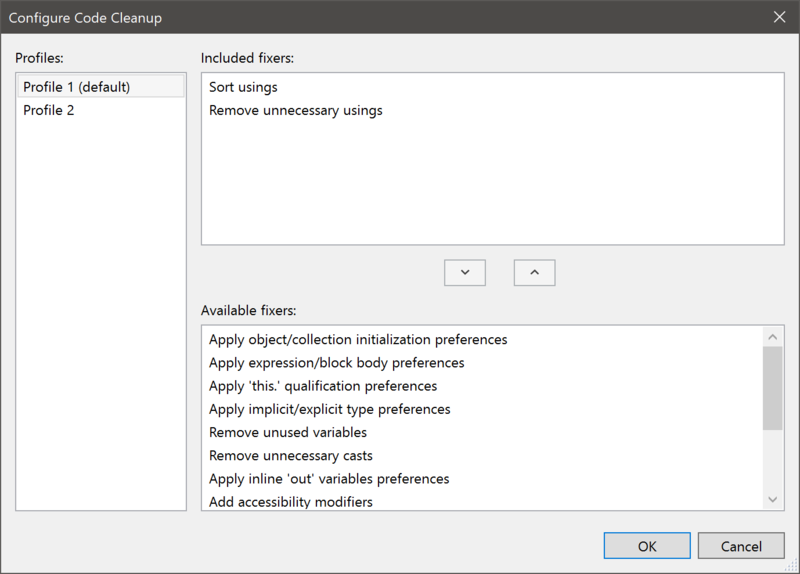 If you are a C# developer, you can quickly clean up some of the most common coding suggestions using Code Cleanup. Select the set of fixers you'd like to have run by configuring Code Cleanup. See the contents of your clipboard history via a context menu that extends the Clipboard Ring (Ctrl + Shift + V). The improved Per-Monitor Awareness (PMA) experience is now turned on by default for users that meet the minimum set of requirements (.NET 4.8 Preview & and Windows 10 April 2018 Update or newer). Tool windows such as Toolbox, Breakpoints, Watch, Locals, Autos & Call Stack have been converted to PMA and thus render sharply regardless of your display configuration and/or scaling. A revised Blue theme experience that addresses feedback by dialing down the luminosity, improving contrast and addressing other usability issues. Enhanced window-dragging capabilities by leveraging available free space in the toolbar region as a draggable region. You can now save a collection of Code Cleanup fixers as a profile so you can quickly select the set of fixers you want run during Code Cleanup. We've added tags in the Extensions and Updates dialog to help you quickly understand whether an extension is in Preview, is a Paid extension, or is in a Trial period. The recommended way to implement data tooltips in Visual Studio 2019 and later is now IAsyncQuickInfoSourceProvider. Legacy Editor Quick Info APIs IVsTextTipData and TextTipData are deprecated in Visual Studio 2019 Preview 1. The Editor Smart Tags (ISmartTag* family of interfaces in Microsoft.VisualStudio.Language.Intellisense namespace) have been deprecated in favor of the LightBulb API and are no longer supported starting with Visual Studio 2019 Preview 1. The solution options Show advanced build configurations, Always show solution, and Save new projects when created have been removed due to low usage. These values have been set to their default value of True. Opt in or out of certain preview features using the new Preview Features page found in Tools > Options > Environment > Preview Features. We have added a new shortcut for Build Selection for folders and solutions: Ctrl + B. Quickly open large solutions by loading your solution with all projects unloaded. 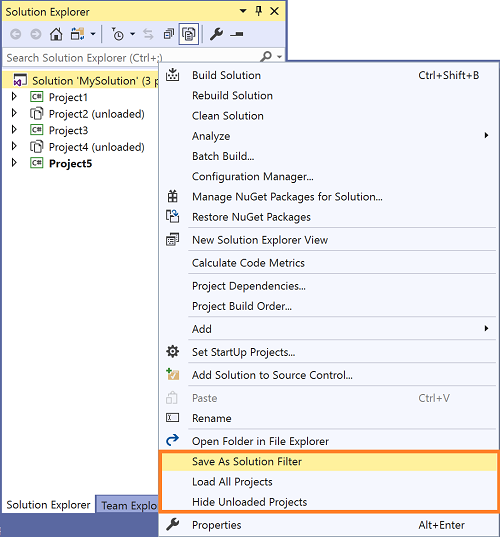 Create a Solution Filter File by unloading projects you don't want opened automatically, right-clicking the solution, and selecting Save As Solution Filter. You can then use the filter file to open the solution for subsequent uses. We have added a command to Build All for CMake files: Ctrl + Shift + B. We've improved IntelliSense performance in C++ files in CMake projects. We've added a command to load unloaded project dependencies to the project and solution context menus. Notification tips to improve performance of Visual Studio are now persisted in the performance center, accessible via Help > Manage Visual Studio Performance. You can now see your solution load progress in the Task Status Center, as well as alerts when your solution loads finish. Experience improved build asset discovery and file search when you Ctrl+T in Open Folder scenarios. Notice performance improvements now that the Visual Studio editor will limit the impact of auxiliary components on typing performance. Particularly, it will auto-cancel any long-running, nonessential operations when typing. 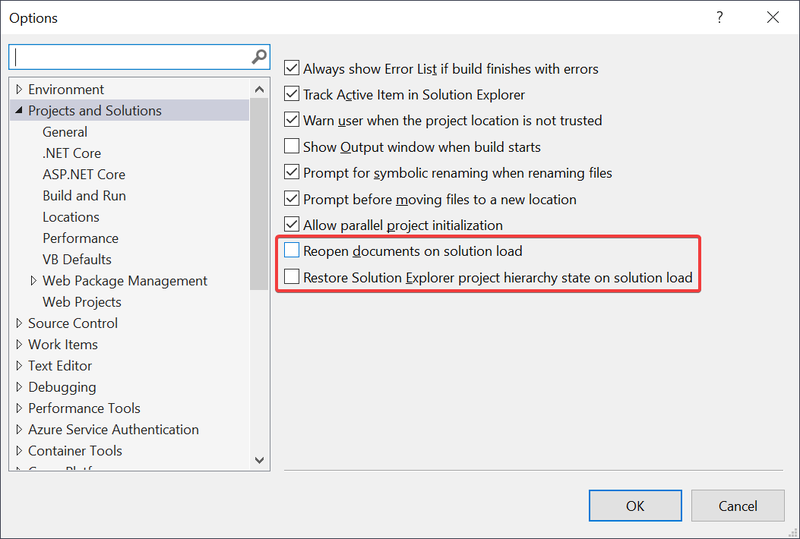 You can now disable the restoration of the project hierarchy state from the previous session in the Solution Explorer tool window. We implemented this change because restoring the project hierarchy from previous session at solution open can delay solution load. Toggle this option in Tools > Options > Projects and Solutions > General. * You can now disable the restoration of the tool window's state from the previous session and instead always load Solution Explorer and Team Explorer at startup. This change was implemented because restoring tool windows from previous sessions can delay solution loads at startup. * Toggle this option in **Tools > Options > Environment > Startup**. Highlight, find, and navigate with keywords using our new search feature that we integrated into the Watch, Autos, and Locals windows. View a dropdown of specifiers and options to format data in the Watch, Autos, and Locals windows by appending a comma to a listed item. You can now use custom and DataSet visualizer support for .NET Core. For C++ applications running on Windows, PDB now load in a separate 64-bit process. This change addresses a range of crashes caused by the debugger running out of memory when debugging applications that contain a large number of modules and PDBs. You can now break when a specific object's property value changes in .NET Core (3.0 or higher) applications using data breakpoints, a feature that was originally exclusive to C++. They are a great alternative to simply placing a breakpoint on a property's setter because a data breakpoint can focus on a specific object's property even when it's out of scope, whereas the former option may result in constant, irrelevant breaks if you have hundreds of objects calling that function. Run dotnet format from the command-line. You will no longer be able to install extensions built with the V1 vsixmanifest extension format in Visual Studio 2019. V1 was introduced in Visual Studio 2010 and was deprecated in Visual Studio 2017 because it could cause reliability issues with Visual Studio. In Visual Studio 2019, the support for V1 has been completely removed. Extensions targeting Visual Studio 2019 should be rebuilt V2 or V3 of the vsixmanifest format. You will now be notified when an extension is synchronously auto-loaded. Note, the extension will load and work as normal in this release, but is at risk of not functioning in the next Visual Studio 2019 update. More details can be found on our blog post about improving the responsiveness of critical scenarios by updating auto load behavior for extensions. In the past, extension authors had to make many separate references to the individual NuGet packages of the Visual Studio SDK they needed to use in their extension. The versions of the various packages weren't always aligned and that often resulted in dependency conflicts at compile time as well as runtime issues. To solve these issues, use a new package called Microsoft.VisualStudio.SDK which contains dependencies on all the packages that make up the Visual Studio SDK. It solves the issue of version mismatches as well as makes it easy to know which version to use. Simply use the version of the package that corresponds to the lowest version of Visual Studio your extension supports and you will have access to the entire SDK. Right now, only version 15.9 of the SDK package exists, but more will be released in the months to come all the way to version 14.0. A new Empty VSIX Project template has been created and it is the same as the VSIX Project template but without the AsyncPackage class. It also references the unified SDK NuGet package providing a good starting point for MEF extensions and other package-less extension types. There hasn't been an easy way to see if an extension was marked as free, paid, or a trial. This now changes so that inside the Extensions and Updates dialog, each extension that is either a trial or paid will be marked clearly as such. Extensions that don't have a trial/paid label are free. Additional APIs in the Test Window that were previously undocumented but marked as public have been added to the deprecation list. Temporarily store changes so you can work on another task now that Team Explorer's Git tools support Git stash. Review, run, and even debug pull requests from Azure Repos without leaving the IDE using our brand-new pull request experience in Visual Studio 2019. To get started, you can download the Pull Requests for Visual Studio extension from the Visual Studio Marketplace. The MSBuild toolset version has been changed from 15.0 to Current. MSBuild.exe is now in %VSINSTALLDIR%\MSBuild\Current\Bin\MSBuild.exe. MSBuild (and Visual Studio) now targets .NET Framework 4.7.2. If you wish to use new MSBuild API features, your assembly must also upgrade, but existing code will continue to work. For every release prior to Visual Studio 2019, the default C# language version was always equivalent to Latest Major. In Visual Studio 2017, C# evolved and released three minor versions: 7.1, 7.2, and 7.3. However, new projects were still defaulting to C# 7.0. This proved frustrating for C# developers who wanted to use new features, but had to manually change the language version for each new project. If you are targeting .NET Core 3.0 preview, the C# language version will be C# 8.0 Preview. If you are targeting .NET Framework or any non-preview of .NET Core, the C# language version will by C# 7.3. This allows the use of the latest stable C# language features by default, and when using .NET Core previews, the use of C# 8.0 preview language features that align with .NET Core 3.0 Preview. If you specify a language version via LangVersion in a project or props file, that language version overrides the previously described default. Collaborate in real time now that Visual Studio Live Share supports C++. Save time by by using IntelliCode, an optional extension that uses its extensive training and your code context to put what you're most likely to use at the top of your completion list. For C++, IntelliCode offers the most help when you are using popular libraries like STL. We have modified several project template names and descriptions to fit with the updated New Project dialog. We have removed the Clang/C2 experimental component. Use the MSVC toolset for full C++ standards conformance with /permissive- and/or /std:c++17, or the Clang/LLVM toolchain for Windows. See the Visual C++ Team Blog for more details. The C++ Android experience now defaults to Android SDK 25 and Android NDK 16b. Code analysis now runs automatically in the background. Warnings display as green squiggles in-editor as you type. The Template Bar now utilizes the Peek Window UI rather than a modal window, supports nested templates, and prepopulates any default arguments into the Peek Window. An automatic fix-it for the NULL->nullptr code analysis warning (C26477 USE_NULLPTR_NOT_CONSTANT) is available via the lightbulb menu on relevant lines, enabled by default in the C++ Core Check Type Rules ruleset. Additional quick fixes in the IDE include adding missing #include directives, fixing missing semicolons, and fixing incorrect uses of '*' versus '&'. Precompiled headers are no longer generated by default for C++ console and desktop apps. Go to Definition now works on #include directives, opening the corresponding file. This includes the F12 shortcut, providing an easy way to navigate around your code. Hovering over a closing brace of a code block provides some helpful information about the context of that block. We've added support in ConcurrencyChecker for well-known STL types from the <mutex> header. An updated partial implementation of the Lifetime profile checker is available for detecting dangling pointers and references. We've added initial support in the compiler for the C++20 operator <=> ("spaceship") for three-way comparison. We've improved performance of IntelliSense for C++ files in CMake projects. Visual Studio helps bootstrap your C++ development with CMake on Linux by detecting if you have a compatible version of CMake on your Linux machine. If not, it offers to install it for you. The CMake Settings Editor provides an alternative to CMakeSettings.json and provides some parity with CMakeGUI. The CMake menu has been removed and reorganized for closer parity with projects and solutions. Incompatible settings in CMakeSettings, such as mismatched architectures or incompatible CMake generator settings, show squiggles in the JSON editor and errors in the Error List. The vcpkg toolchain is automatically detected and enabled for CMake projects that are opened in the IDE once vcpkg integrate install has been run. This behavior can be turned off by specifying an empty toolchain file in CMakeSettings. CMake projects now enable Just My Code debugging by default. Static analysis warnings can now be processed in the background and displayed in the editor for CMake projects. We've added clearer build and configure 'begin' and 'end' messages for CMake projects and support for Visual Studio's build progress UI. Additionally, there is now a CMake verbosity setting in Tools > Options to customize the detail level of CMake build and configuration messages in the Output Window. The 'cmakeToolchain' setting is now supported in CMakeSettings to specify toolchains without manually modifying the CMake command line. We've implemented build throughput improvements, including the linker's handling of File I/O and link time in PDB type merging and creation. We've added basic support for OpenMP SIMD vectorization. This can be enabled with the new CL switch -openmp:experimental. This allows loops annotated with “#pragma omp simd” to potentially be vectorized. The vectorization is not guaranteed, and loops annotated but not vectorized will get a warning reported. If no SIMD clauses are supported, they will simply be ignored and a warning will be reported. We've added a new inlining command line switch -Ob3, which is a more aggressive version of -Ob2. -O2 (optimize the binary for speed) still implies -Ob2 by default; if you find the compiler is under-inlining, consider passing -O2 -Ob3. To support hand vectorization of loops containing calls to math library functions and certain other operations like integer division, we've added support for Short Vector Math Library (SVML) intrinsic functions that compute the 128-bit, 256-bit or 512-bit vector equivalents. See the Intel Intrinsic Guide for definitions of the supported functions. The Managed C++ Test Project template is no longer available. You can continue using the Managed C++ Test framework in your existing projects but, for new unit tests, consider using one of the native test frameworks for which Visual Studio provides templates (MSTest, Google Test) or the Managed C# Test Project template. The Windows 8.1 SDK is no longer available in the Visual Studio installer. Please upgrade your C++ projects to the latest Windows 10 SDK. If you have a hard dependency on 8.1, you can download it from the Windows SDK archive. Windows XP targeting will no longer be available for the latest C++ toolset. XP targeting with VS 2017-level MSVC compiler & libraries is still supported and can be installed via "Individual components". Our documentation actively discourages usage of Merge Modules for Visual C++ Runtime deployment. We are taking the extra step this release of marking our MSMs as deprecated. Consider migrating your VCRuntime central deployment from MSMs to the redistributable package. The following C++ ATL/MFC wizards are no longer available: ATL COM+ 1.0 Component Wizard, ATL Active Server Pages Component Wizard, ATL OLE DB Provider Wizard, ATL Property Page Wizard, ATL OLE DB Consumer Wizard, MFC ODBC Consumer, MFC class from ActiveX control, and MFC class from Type Lib. Sample code for these technologies is archived at Microsoft Docs and the VCSamples GitHub repository. ValueOption type and ValueOption module function parity with Option type. tryExactlyOne function for arrays, lists, and sequences, contributed by Grzegorz Dziadkiewicz. fsi.exe and fsc.exe now defaults to .NET Framework 4.7.2, allowing the loading of components targeting this framework or lower (#4946). We optimized methods on structs and struct records to perform as well as methods on classes and class-based records (#3057). We optimized the emitted IL for combined Boolean logic in F# code (#635). We've optimized the use of + with strings in F# to call the minimal amount of String.Concat calls as possible (#5560). We fixed an issue in the FSharp.Core package where some extra directories with test assets were included. FSharp.Core 4.5.5 and 4.6.1 should have the fix (#5814). When a user-defined attribute does not inherit from the Attribute class, you will now receive a warning, by Vasily Kirichenko. The AssemblyInformationVersionAttribute value in a project file now supports arbitrary values to support scenarios such as SourceLink (#4822). A bug where illegal syntax with Active Patterns would cause an internal compiler error has been fixed by Steffen Forkmann (#5745). A bug where the Module suffix was erroneously added to a module in a recursive module to match a type where the only difference is a generic parameter was fixed by BooksBaum (#5794). An improvement to the error message when type parameters are not adjacent to a type name has been improved by Alan Ball (#4183). The uint16 literal suffix is listed correctly in the error messages for invalid numeric literals, by Teo Tsirpanis (#5712). Error messages for computation expressions no longer state async in the message and instead refer to "computation expression(s)", by John Wostenberg (#5343). An error message when incorrectly referencing .dlls in F# interactive was fixed by Bartoz Sypytkowski (#5416). A bug where Statically Resolved Type Parameters couldn't handle calling a member that hides an inherited member was fixed by Victor Peter Rouven Müller (#5531). Various smaller performance improvements to the compiler have been added by Steffen Forkmann and Robert Jeppesen. Another big focus area for F# in Visual Studio 2019 has been performance for medium and large solutions. We addressed some very long-standing issues, some of which dating back to the very first edition of F# tools for Visual Studio. We also got some help from the excellent F# open source community. We've revamped how the F# language service is initialized by Roslyn. Type colorization for larger solutions should generally appear sooner. We changed our representation of source text to avoid large allocations over time, especially with bigger files (#5935, #5936, #5937, #4881). We changed our build caches for small edits to files to use significantly less memory (#6028). We modified a compiler feature that suggests names when unrecognized tokens are typed to only compute these suggestions on-demand, resulting in significant CPU and memory reductions when typing slowly in larger solutions (#6044). We changed IntelliSense so that it will no longer show symbols from unopened namespaces by default. This notably improves performance for IntelliSense in projects with many references. This feature can be turned back on in the settings via Tools > Options > Text Editor > F# > IntelliSense. We improved memory usage when using Type Providers to generate very large amounts of provided types in a completion list (#5599). A reduction to CPU and memory usage to an internal string comparison algorithm for suggesting unrecognized names has been fixed by Avi Avni (#6050). A notable source of large string allocations, particularly for IDE tooling, was fixed by Avi Avni (#5922). The Add open statement code fix will now default to adding the open statement at the top of the file. We fixed a bug where match! in user code invalidated structure guidelines and code outlining nodes for subsequent scopes (#5456). The editor will now correctly color byref, outref, and ref values as record fields with the mutable value colorization (#5579). We fixed a bug where the rename refactoring did not recognize the ' character in symbol names (#5604). We've fixed a longstanding bug where renaming F# script files resulted in a loss of colorization data (#1944). We cleaned up IntelliSense so that it doesn't show unrelated items in the list when pressing backspace. With "Smart" indentation on, pasting F# code into the editor will now format it to match an appropriate scope based on the current cursor position, implemented by Saul Rennison (#4702). An issue where F# editor options weren't syncing has been fixed by Jakob Majocha (#5997, #5998). We've fully migrated the F# and F# tools codebase to use the .NET SDK. This dramatically simplifies the contribution process for developers, especially if they are not using Windows. Additionally, Jakob Majocha has helped in cleaning up documents for new contributors in light of the changes to the codebase. We added a new Add environment dialog that simplifies the experience of creating and adding virtual environments and conda environments in your project. 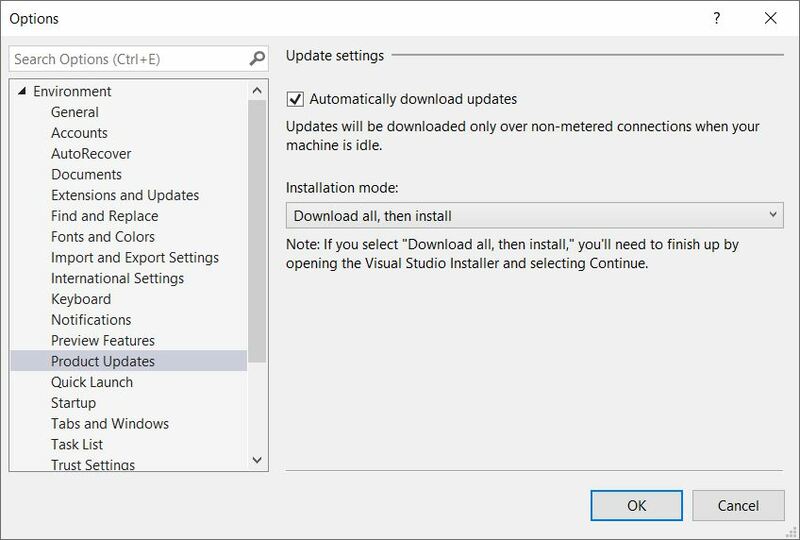 The Visual Studio installer no longer installs full versions of Anaconda to reduce the size of Visual Studio installs and avoid errors during upgrades. Miniconda is bundled with Python workload as an optional component, enabling you to create conda environments without having to install Miniconda/Anaconda. You will now be automatically prompted to add an environment if a requirements.txt (virtual environment) or environment.yml (conda environment) is present at the root of your project. A new Python Environments toolbar is available when editing Python files. The new toolbar enables you to switch between different Python interpreters when working with projects, Open Folder workspaces or loose Python files in other projects. Improvements to the quality of auto-completions in Python IntelliSense, including improved detection of relative and namespace imports. Django project templates have been updated to support Django 2.x. Function return values are now shown in the Python debugger. You can now create VS Live Share sessions and collaborate on Python code with other Visual Studio users. Previously, Python was only supported when joining sessions created from Visual Studio Code. We have implemented performance improvements in the language service as a result of increasing the memory cap on the language service to handle larger projects. We have made improvements to the Git Work Items experience with Azure DevOps. Assign work items to yourself or others with the new identity picker. By default, you will be shown a list of the people you have most recently used. Or, use the search ability to search and find others in your organization. We have improved the #mentions experience in the commit message. As you select a work item from the #mention picker, it will automatically be added to the Related Work Items list. We have added support for hot path highlighting in both the CPU Usage and DotNet Object Allocation tools in the Performance Profiler. Select any function in the call tree and press the hot path button to expand the CPU Usage or Dot Net Object Allocation hot path. This feature allows you to easily identify the function calls which use the highest percentage of the CPU or that allocate the most objects. We have implemented various small UX improvements to the publish profile summary page (new section headers and actions/shortcuts) for all applications. When publishing ASP.NET applications to Azure App Service, the publish profile summary page now has a new section called "Dependencies". This new section currently allows you to associate Azure Storage and Azure SQL resources with your app service instance. Expect more Azure services to be surfaced through this mechanism in the future. Use code metrics with .NET Core projects with our added compatibility. Export editor settings to an Editorconfig file through Tools > Options > Text Editor > C# > Code Style with the button "Generate .editorconfig file from settings". Use C# and Visual Basic's new Regex parser support. 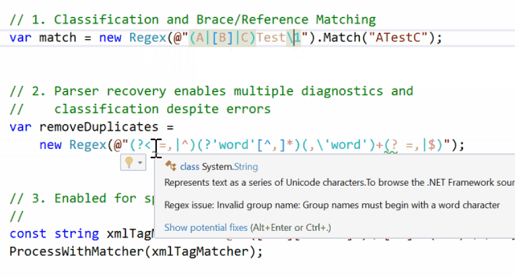 Regular expressions are now recognized, and language features are enabled on them. Regex strings are either recognized when a string is passed to the Regex constructor or when a string is immediately preceded with a comment containing the string language=regex. The language features included in this release are classification, brace matching, highlight references, and diagnostics. You can now use dead code analysis for unused private members with an optional code fix to remove unused member declaration. The Find References feature on an accessor now only returns results for that accessor. We have added a code fix for generating a deconstruct method. "Using" statements can be added when code is pasted into a file. A code fix appears after pasting recognized code that prompts you to add relevant missing imports. For cases where "await" is implied but omitted, there is now a compiler warning. For converting a local function to a method. For converting a tuple to a named-struct. For converting an anonymous type to a class. For converting an anonymous type to a tuple. For a foreach loop to LINQ query or to LINQ method. You now have added support for ASP .NET Core applications running in an Azure Kubernetes Service. To get started, see this docker example over on GitHub. ASP.NET is now supported in the CPU Usage tool of the Performance Profiler. You can now use Find All References (Shift-F12) and CodeLens to show results from Razor (.cshtml) files in .NET Core projects. You can then navigate to the identified code in the relevant Razor files. We've added support for targeting ASP .NET (core and desktop) applications running on Windows Virtual Machines (VM) and VM Scale Sets. You will now receive a warning when running code analysis using FxCop. .NET Compiler analyzers are the recommended way to perform code analysis going forward. Read more on migrating to .NET compiler platform analyzers. Portable Class Library (PCL) project templates are no longer available, and project support will not be installed by default. New projects intended to target multiple platforms should use the .NET Standard project type. Customers who require PCL project support must install the component separately from the Individual Components tab in the Visual Studio installer. The "Project.CopyWebSite" command is no longer available. This feature was only available on the "Web Site" project type for .NET. It provided the ability to synchronize two web sites so that they have the same version of each file. 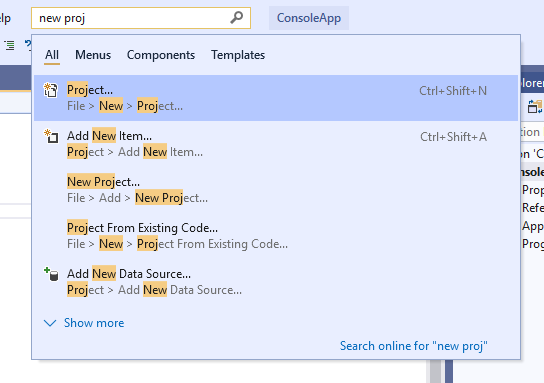 In Visual Studio 2019, you can copy the files from the remote destination outside of Visual Studio and then open the project. The ability to open a Web Site project from a remote FTP location has been removed. 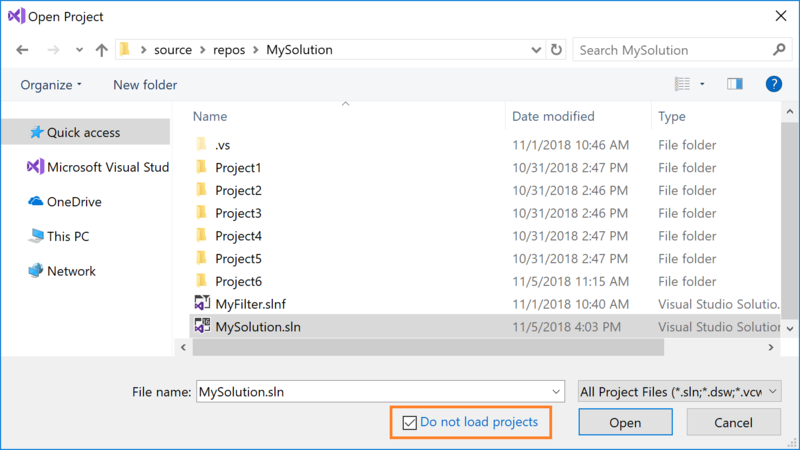 FTP users can copy the files from the remote destination outside of Visual Studio, open the project and make changes, and then use publish to push them back to the remote FTP location. The ASP.NET and Web workload no longer installs a custom CoffeeScript editing experience. Visual Studio's TextMate bundles provide a superior experience for working with CoffeeScript. CSS and CoffeeScript errors that are currently generated by built-in copies of CSSLint and CoffeeLint will no longer automatically surface when editing those files. Use an alternative method for running linters such as npm or the Visual Studio Task Runner Explorer. Visual Studio no longer provides IntelliSense for Knockout HTML attributes. 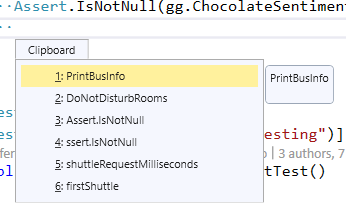 In Visual Studio 2019 you will need to type the attributes. We've added support for debugging ASP.NET Core Applications that use Alpine as a base image. We've added support for the latest ASP.NET and .NET Core images. With this release, you can create ASP.NET Core, Console, and Class Library projects targeting .NET Core 3.0 if you have the preview SDK installed. If you are using Visual Studio RC, you need to also go to Tools > Options > Projects and Solutions > .NET Core and check the Use previews of the .NET Core SDKs checkbox. If you are using Visual Studio Preview, you do not need to do this. You can read more about this setting and its behavior in .NET Core tooling update for Visual Studio 2017 version 15.9. You can also create Windows Forms or WPF projects for .NET Core 3.0 with the "dotnet new" command. These projects can then be opened in Visual Studio 2019. For F5, the console window will not automatically close when the app is finished executing. You no longer need to add Console.Read() calls to your console apps. The new console window can be closed automatically by pressing a key when it is open or by selecting the option under Tools > Options > Automatically close the console when debugging stops. Support for License Expressions and License Files has now been added to project property pages. This aligns with changes to deprecate licenseUrl in NuGet. The scalability of large solutions has been significantly improved, allowing the use of much larger .NET Core solutions than before. Solution load times for large projects have been significantly reduced, as has the CPU and memory usage when loading them. A long-standing issue where configuration changes were not respected at design-time, forcing a project reload, has been addressed. It is now possible to Go to definition from Razor to C# in ASP.NET Core projects. There is now support for AvailableItemName Items. There is now support for automatic nesting of dependent files which are added to the project via globbing. Support for XamlAppDef has been added by William Kent. You can find a full list of issues and pull requests in the 16.0, 16.0 Preview 2, 16.0 Preview 3, and 16.0 Preview 4 milestones. Add Editorconfig when_multiline option for csharp_prefer_braces. New classification colors are available from the .NET Compiler Platform SDK (aka Roslyn). New default colors, similar to the Visual Studio Code colors, are gradually being rolled out. You can adjust these colors in Tools > Options > Environment > Fonts and Colors or turn them off in Environment > Preview Features by unchecking the Use enhanced colors check box. We’d appreciate hearing feedback on how this change affects your workflow. Note: Visual Studio, by default, will launch Chrome using a different data directory than your regular Chrome instance unless you provide the path to your data directory as an argument. 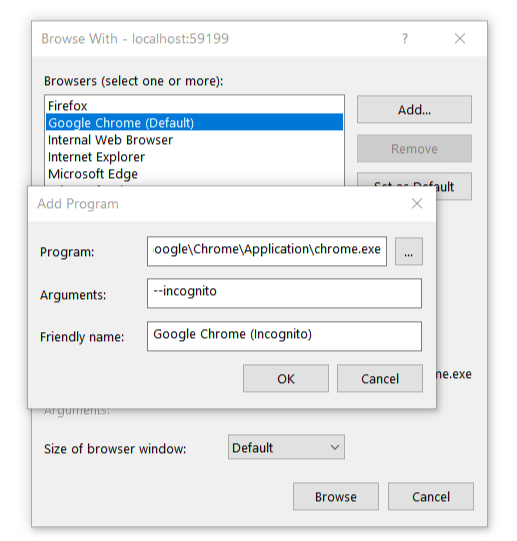 As a result, if you require any extensions to be available when using this Chrome instance, you will need to install them the first time. 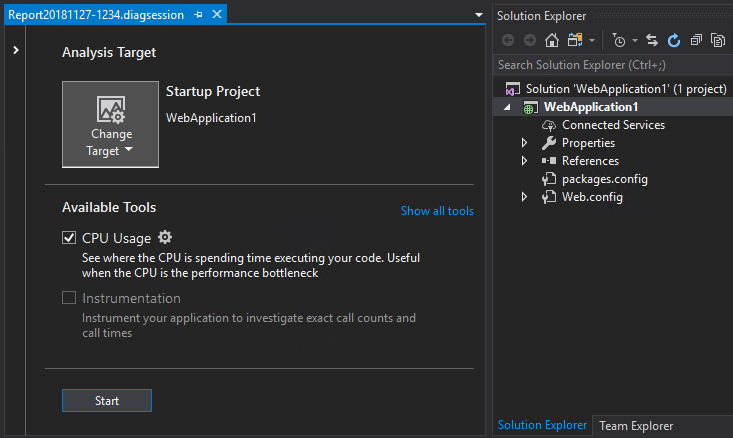 Visual Studio 2019 comes with a new experience for creating new projects. When creating new ASP.NET projects specifically, Visual Studio offers additional dialogs that surface ASP.NET specific choices. These additional dialogs have been updated to match the visual style of the rest of the experience. For a while now, publish credentials in Visual Studio are encrypted and stored in the publish profile user file so you don't have to re-enter them every time you publish your application. User files in general are excluded from source control by default because they are likely to contain secret and/or personal information that should not be shared. Up until now, if a publish profile for an Azure Functions project was checked into source control but the user file was not, the publish credentials were missing and the publish profile could not be re-used. Now, we allow for the credentials to be edited and a new user file to be created so that the publish profile can be re-used. 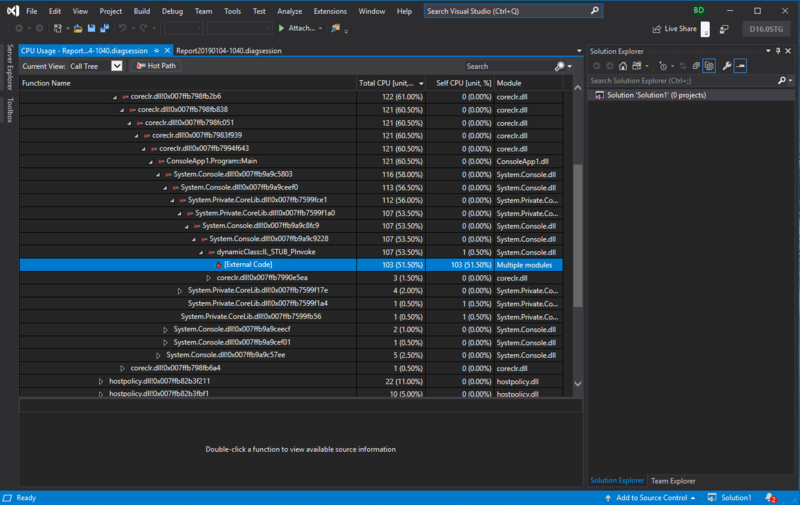 In Visual Studio 2019, the profiling experiences that were available in the Performance Wizard have been moved to the Performance Profiler. You can find the CPU Usage Tool for sampling, and instrumentation in the Instrumentation tool in the Performance Profiler. With this change the Performance Wizard is no longer needed and has been removed from Visual Studio 2019. Additionally, the sampling option in the VS Performance command line tools have been removed, a replacement command line tool will be released in an upcoming preview. You can now right-click on tests, test classes or test projects in the Solution Explorer to run or debug tests. Test runs now auto-detect what processor architecture is set in the project properties. OSS UI test tools such as Selenium and Appium have gained momentum and have a strong community backing. Because these frameworks have become industry standards, we deprecated Coded UI test for automated UI-driven functional testing. Visual Studio 2019 will be the final version of Visual Studio with Coded UI test features. We recommend using Selenium for testing web-applications and Appium with WinAppDriver for testing desktop and UWP apps. Visual Studio 2019 will be the last version of Visual Studio with load test features. For customers requiring load testing tools, we recommend using alternate load testing tools such as Apache JMeter, Akamai CloudTest, Blazemeter. In Visual Studio 2019, some test window APIs that were previously marked public but were never officially documented have been removed. They were marked deprecated in Visual Studio 2017 to give extension maintainers an early warning. To our knowledge, very few extensions have taken a dependency on these APIs. These APIs include IGroupByProvider, IGroupByProvider, KeyComparer, ISearchFilter, ISearchFilterToken, ISearchToken and SearchFilterTokenType. If this change affects your extension, please let us know by submitting an issue on Developer Community. 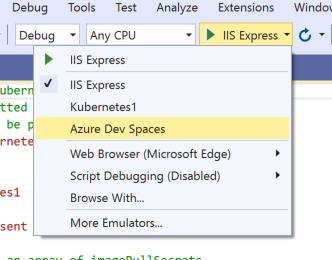 The Visual Studio Kubernetes Tools, which were previously available as a separate extension for Visual Studio 2017, are now integrated into the Azure development workload in Visual Studio 2019. To add Kubernetes support to a new project, open Visual Studio and select the Create a new project option. In the Create a new project window, search for Kubernetes and select the Container Application for Kubernetes project template. Click Next and enter a project name, location, and solution name. Then, click Create. Select the ASP.NET Core application template you want to use for your project and click OK. Visual Studio will automatically create a Dockerfile and Helm chart that you can use to build and deploy your new application to a Kubernetes cluster. You can modify these artifacts as needed. You can also add support for Kubernetes to an existing ASP.NET Core application. To do this, open the project in Visual Studio 2019. In Solution Explorer, right click on the project, point to Add, and click Container Orchestrator Support. In the Add Container Orchestrator Support dialog, choose Kubernetes/Helm and click OK. Visual Studio will automatically create a Dockerfile and Helm chart (in a folder named charts) that you can use to build and deploy your application to a Kubernetes cluster. If either of these artifacts are already in place, they will not be overwritten. You can modify these artifacts as needed. 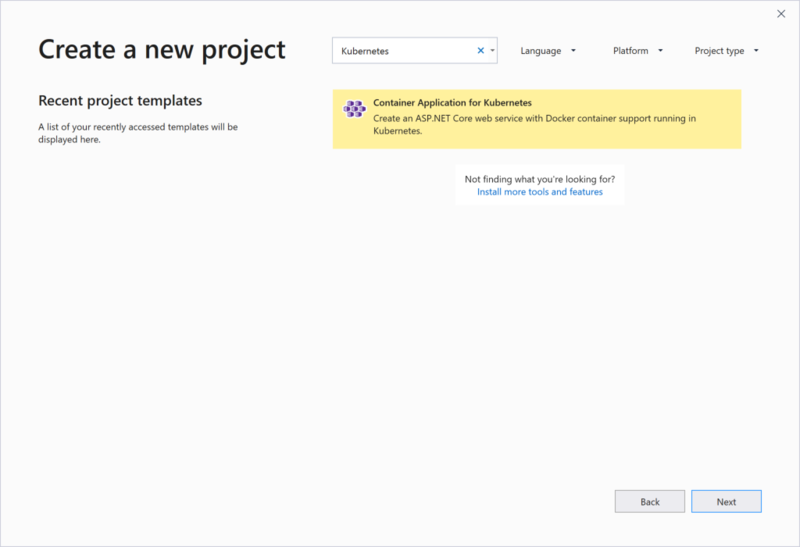 When you add Kubernetes support to a new or existing project, Visual Studio will ask you if you want to create a publicly accessible endpoint for your application. If you click Yes, Visual Studio will configure the Helm chart for your application to create a Kubernetes ingress object when the application is deployed to a Kubernetes cluster. You can change this option at any time by modifying the Helm chart. Once you have added Kubernetes support to a new or existing project, you can easily build, run, and debug your application in a live Azure Kubernetes Service (AKS) cluster, using a feature called Azure Dev Spaces. This is useful for testing your project in the context of an actual Kubernetes cluster or for debugging a service that is part of a much larger application without having to replicate the entire application locally. 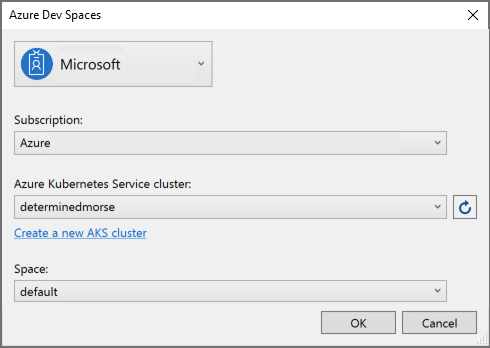 Azure Dev Spaces also includes functionality that allows your development team to share an AKS cluster. For more information on Azure Dev Spaces, see the Azure Dev Spaces documentation. To get started, ensure that Azure Dev Spaces is selected as the debug launch target in Visual Studio. 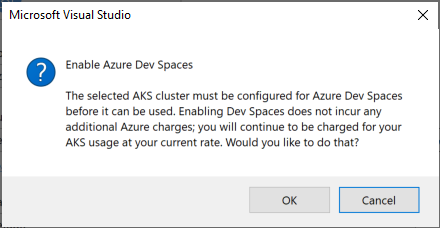 Before launching your project in Dev Spaces for the first time, configure the Azure subscription and AKS cluster that you wish to use. Also, select the space where you wish to run the project. Typically, your team runs the latest stable version of the entire application in the default space. Then, you run your version of the service you are working on in a child space of the default space. There is now no need to run the other services in the child space; Dev Spaces automatically routes calls from your service to the stable versions of the services running in default. For more information on how to set this up, see the team development tutorials in the Azure Dev Spaces documentation. Once you have selected the correct subscription, cluster, and space, click OK to proceed with the Dev Spaces configuration. If you select a cluster that does not already have an associated Dev Spaces controller, click OK in the following dialog box to create one automatically. Controller creation takes about 2 minutes. You can click on the Background Tasks button in the lower left corner of the Visual Studio window to see the status. Once you have a Dev Spaces controller ready to go, press F5 or click the Azure Dev Spaces debug button on the toolbar to debug your project in AKS. Dev Spaces will synchronize your code to Azure, build a container image containing your code, and deploy it to your AKS cluster using the Helm chart defined in your project. Visual Studio will open up a remote debug connection to the service running in the cluster so you can interact with it just as you would when debugging a service running locally. This release includes improvements to workload size and Android build performance and reliability, as well as enhancements for Xamarin.Android and Xamarin.Forms productivity. The Xamarin workload is now just 7.69GB, a 2x reduction from Visual Studio 2017 version 15.9 and a 3x improvement over version 15.7. The IntelliCode extension now supports Xamarin.Forms XAML. We made performance improvements aimed at reducing the time it takes to create a new Xamarin project so you can start building your apps faster. We also now include the NuGet packages used by the templates as part of the workload installation in order to reduce package restore time, especially in low bandwidth or offline situations. These improvements reduce the time for a new Xamarin project to be completely loaded and restored by almost 50% in some cases. You can now see more detailed build progress information when building your projects. Clicking the background tasks icon in the bottom left corner during a build will display the current build target that is running. This can be useful for determining if the build is still running but a target is taking a long time to complete. You no longer have to build your project for the Xamarin.Forms XAML Previewer to show you a preview of your code! If you have custom controls in your XAML file, you might need to build your project to preview those, or opt them into design time rendering. You can now swap between different Android and iOS devices to preview your Xamarin.Forms XAML on using our new device drop-down menu. You can now edit the most common attributes of Xamarin.Forms controls, cells, and layouts in a property panel and see those changes reflected immediately in your XAML. We updated the Xamarin.Forms templates to use the latest Xamarin.Forms release and also added a new template option for a Xamarin.Forms Shell app. Shell aims to reduce the complexity of apps while increasing developer productivity and focusing on rendering speed and memory consumption. This template gives you a bootstrapped Shell app for Android and iOS. In Visual Studio 2017 version 15.9 and Visual Studio for Mac 7.7, we made initial build performance and build correctness improvements. In Visual Studio 2019 and Visual Studio for Mac 7.8, we made building and deploying even faster. By enabling this tool in your projects, you enable enhanced performance at both build time and runtime. For more details on these properties, see our documentation on the Build Process in Xamarin.Android. 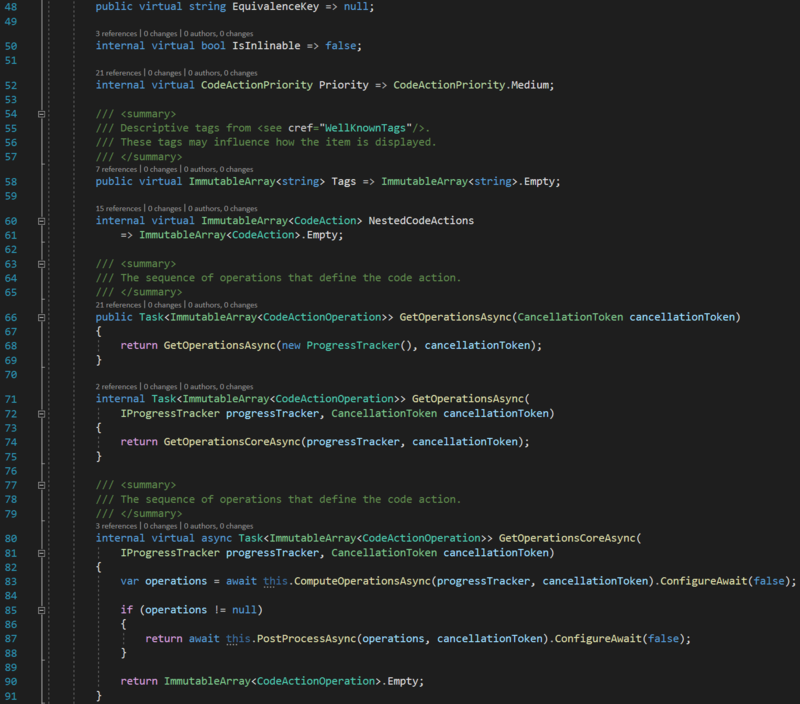 In Visual Studio 2019, Android emulator images are easier to create. We've also continued to work with the Windows team in the Windows 10 October 2018 Update, version 1809, to improve the performance of the Android emulator when running on Hyper-V.
New users can create their first image by simply pressing the run icon. Our emulator acquisition experience automatically determines the best configuration for your setup and takes advantage of hardware acceleration (with Intel HAXM or Hyper-V) and quick boot by default. When you want to create another image, you can select Create Android Emulator from the dropdown to open the Android Device Manager. We have released a set of initial build performance improvements. As of today, Xamarin.Android 9.1.1+ includes significant build performance improvements in comparison to the previous release. Check out our Xamarin.Android 15.9 vs. 16.0 build performance comparison for more details. d8 is a next-generation dex compiler that runs faster and produces smaller .dex files with better runtime performance. r8 is a new tool for shrinking and minification that converts Java bytecode to optimized dex code that replaces the need for ProGuard. For more details on d8 and r8, check out our documentation. We have made a number of productivity enhancements to the interactions in Split View. Drag and drop directly from the toolbox to the source editor to help quickly scaffold your Android layouts. Select elements directly from their XML definition span in the source editor. We implemented this by synchronizing the caret position with the corresponding Android view, allowing you to quickly access an element's properties in the property panel right from the editor. Use an inline color preview to your XML code so you can see what colors are being used in your controls. Use our quick info feature by hovering over a value to find out more about it, such as where it's defined or what the hexadecimal value for the color is. We’ve begun an effort to improve startup speed of the Android Designer. As part of this effort, we have also improved the messaging that the designer provides while it is loading. Alongside these improvements, the Android Designer now natively supports Android Pie (9.0) and provides autocompletion for ConstraintLayout attributes. When using IntelliSense to add a widget to a layout, a full snippet experience is now provided so that required attributes can be supplied from the start. We have added smart commenting and uncommenting for Android XML layouts. You can now Ctrl + Click on resource URLs to navigate to the file or line where they are defined. IntelliSense/Autocompletion is now supported for other Android XML files other than layouts (colors, strings, drawables, menu, Android manifest, etc.). The IntelliCode extension now supports XAML. To reduce Visual Studio setup complexity and size, Windows Phone emulators have been removed from Visual Studio installation. You will now need to download the emulators manually. XAML design time tooling for UWP apps targeting Windows 10 SDKs before the Windows 10 Fall Creators Update (build 16299) has been removed. Retarget your applications to Windows 10 version 1709 or higher to use the XAML Designer, or use the XAML editor. UWP test projects using project.json to define NuGet dependencies are no longer supported. You must upgrade your project to use the new PackageReference format. In Visual Studio 2019, we made a few changes to the Office, SharePoint, and VSTO templates. The SharePoint 2019 templates that were added in Visual Studio 2017 15.9 are also available in Visual Studio 2019. We have removed support for SharePoint Sequential Workflow or State Machine Workflows. While you will not be able to create or open these workflows in Visual Studio 2019, you can continue to edit them in previous releases of Visual Studio. Office 2010 templates will no longer be available. However, you can still open existing Office 2010 projects in Visual Studio 2019. The Office 2013 and 2016 templates have been renamed to reflect that they support Office 2013 and above. We are releasing a new, streamlined, developer-centric experience when connecting Team Explorer to an Azure DevOps project. Focus on relevant work items by filtering and pivoting your view based on work items assigned to you, ones that you're following, ones where you're mentioned in the discussion, and ones based on your activity. Within each view, you can create a work item inline, perform simple inline edits, mark a work item as complete, and associate a work item to pending changes. Create a local branch from a work item which will automatically relate the work item to the changes made to that local branch. This is the default experience. Should you want to switch to the legacy experience, you can by setting the Work Items experience in Visual Studio. Note that this new experience is only true for Git repos. The new experience for TFVC repos will available in a following update. Search for work items when doing a #mention in the pending changes commit message. For more details, see the View and add work items using the Work Items page. Support for Microsoft Project has been removed from the Team Foundation Server Office Integration 2019 plug-in for Visual Studio 2019 due to a low adoption rate in Azure DevOps. You will now need to export your work items to Excel and manually paste them into Project. Support for PowerPoint has been removed from the Team Foundation Server Office Integration 2019 plug-in for Visual Studio 2019. However, users can still create storyboards in PowerPoint and link them manually to work items in Azure DevOps. The Application Insights Trends window has been removed in Visual Studio 2019 in favor of alternatives that are more feature-rich. Instead, you can use the Application Insights Search window in Visual Studio or the rich set of diagnostics tools in Application Insights in the Azure portal. The wizards for adding the HockeyApp SDK and creating new beta distributions have been removed. We instead recommend using Visual Studio App Center, the successor to HockeyApp. You can still use HockeyApp normally, except without these shortcuts in Visual Studio. If you would like to learn more about HockeyApp, check out our support page. Value cannot be null. Parameter name: pUnk when checking in code to TFS. "Subtype Designer" is added unnecessarily to xml-based files like csproj. TLS 1.0: The request was aborted: Could not create SSL/TLS secure channel. Solution Explorer: touch pad gesture scroll is too sensitive. Visual Studio 2019 - EF6 edmx文件无法保存-VS 2019 Preview 1 - EF6 edmx file cannot be saved. [WebKit] an undefined class is not allowed as an argument to compiler intrinsic type trait '__is_assignable' (regression). Visaul Studio 2019: nuget package manager has poor contrast. Team Explorer - Changes: panel not sizing to the Team Explorer window. Visual Studio 2017 SQL Server Object Explorer server list not persisting . intellisense problems with linux-x64 mode. Index was out of range. Must be non-negative and less than the size of the collection.Parameter name: index. Visual Studio 2017 UNDO does not work/stops working (reported AGAIN!!!!). Intellisense not working for files created under WSL. Intellisense error: C++11 static constexpr member initialization causes "member may not be initialized". VS doesn't restore windows position when switching in/out of debug. Third party toolbox items are reloaded every time VS2019 Preview 2.2 is started. 'Set as StartUp Project' crashes the IDE after updating to VS2019 Preview Release 3. Visual Studio 2019 building Visual Studio 2017 C++ projects fail. Toolbox controls are making vssettings file too big. SSDT: Fix for Login failed errors when performing a New Data comparison function . SSDT: Fix for Source is Unavailable error when performing Schema Compare . SSDT: Fix for Schema Compare Generate Script does not generate script . Find in files "Locating next match" UI is annoying. Find files keeps defaulting to current document. Quick references freezes VS 2019 RC. Error List does not show errors because it is scoped to "Current Document". Cannot use conditional breakpoint on PropertyInfo.Name value. Visual Studio crashes when parsing macros at the end of a file. Search in Visual Studio 2019 is very slow. Visual Studio hangs when starting debugging. vdproj not supported in Visual Studio 2019 RC. Visual Studio installer welcome image contains offensive element for Chinese. VSIX Extension pre-req has been removed in Visual Studio 2019 RC breaking extension compatibility. Create Project from Start Screen Ignores Selected Project Folder. cpp properties is dialog does not show up when using Project menu item or select "Manage configuration" drop down menu. Visual Studio 2019 Build Tools - developer prompt title says "Developer Command Prompt for Visual Studio 2017". 自动完成功能，如果双击候选项，会丢失输入焦点，需要单机编辑器才能继续输入-AutoComplete function, if you double-click the candidate, will lose the input focus, need a stand-alone editor to continue to enter. Context menus are sometimes placed on the wrong monitor in a multiple monitor configuration. Visual Studio 2019 conflict with QQ Pinyin. Cannot drag maximized Visual Studio window. Modal progress dialog stays open permanently, even when IDE is responsive ('Preparing Solution', 'Creating Project', Edit and Continue, etc). Visual Studio 2019 - Toolbox always shows Initializing. Intellisense in Razor files (.cshtml) is not working..
SSDT schema comparison doesn't highlight differences in files. Visual Studio exception when opening Razor cshtml files. Asp Core : Create new view show error. VS 2019 RC -- Can't create Winforms (.Net Core) -- multiple errors. Project References Not Loading After Branch Switch. Scaffolding error: There are no scaffolders supported for this item. Load configuration only works before the first installation is completed. Dropdown project type = text is partially hidden when "Make Text Bigger" is used. Properties Window in Forms Designer shows vertical scrollbar without drag handle with automatic scaling on 4K display in Visual Studio 2019 RC. Razor autocomplete works until you tab/enter then it uses html. VSIXInstaller.exe crashes randomly when installing multiple extensions sequentially in Visual Studio 2019 RC.1. Moving a } crashes Visual Studio. Telerik UI for WPF controls disabled in Visual Studio 2019 Preview 3 and Preview 4. Visual Studio 2019 RC crashes on startup when using a 3rd party IME (QQ Pinyin, Google IME). Visual Studio 2019 Preview 4 crash if closing undocked Window. Start Page "Remove From List" stops working. $(VCIDEInstallDir) is an invalid path. Missing backslash in Microsoft.Cpp.Common.props. Visual Studio 2019 Preview 2.0+ crashes when opening soultion filter. Manage Extensions toolbar throws exception. SSDT: Fix for SQL files not always being deleted when performing a Schema Compare between a database and a project and a delete table is executed subsequently. SSDT: Accessibility fixes to improve narration capabilities. SSDT: Replaced older sqlncli driver with new Microsoft ODBC Driver for SQL Server. We have fixed slow reload of multiple C# and Visual Basic projects. When IntelliSense is present, when a user types Shift + Enter, the active selection will be completed and a new line inserted. We have fixed a PMA issue where editor tooltips and light bulb doesn't render properly. Notifications about crashes caused by extensions now show up again. Notifications about performance of Visual Studio have been secured against tampering. We have fixed an issue with toolbar rendering when dragged across displays. We have fixed an issue with Tools Options rendering when running with per-monitor awareness enabled. Various DpiHelper classes has been deprecated (extensibility). We have fixed splash screen scaling to better match the primary monitor scale factor. We have fixed an issue in settings import where warnings/errors were not always reported correctly. We have fixed an issue where Tools Options reported software rendering regardless of rendering tier. We have fixed an issue where the name of the open folder was not displayed in the title bar region. We have fixed an issue with find in files positioning when per-monitor awareness is enabled. We have fixed an issue with dock adorner rendering when per-monitor awareness is enabled. You can now use Time Travel Debugging with the snapshot debugger on ASP.NET Apps running on an Azure VM. Please note that this feature may not work in all Azure regions at release. We have updated the Dockerfile scaffolding in Visual Studio Tools for Kubernetes to use the Microsoft Container Registry instead of Docker Hub. We have fixed an issue in Visual Studio Tools for Kubernetes where modifying Dockerfile.develop does not cause the service to be redeployed. We have fixed an issue in Visual Studio Tools for Kubernetes where a service in an Azure Dev Spaces project could fail to start. We have fixed an issue in Visual Studio Tools for Kubernetes where a service in an Azure Dev Spaces project stops running after debugging is stopped in Visual Studio. We have fixed an issue in Visual Studio Tools for Kubernetes where a null reference error dialog is sometimes displayed when picking accounts in the Azure Dev Spaces Dialog. We have fixed an issue in Visual Studio Tools for Kubernetes where the cluster selection dialog is displayed when adding Kubernetes orchestration support. See all existing known issues and available workarounds in Visual Studio 2019 version 16.0 by following the below link. For more information relating to past versions of Visual Studio 2019, see the Visual Studio 2019 Release Notes History page.